Click here for original picture. In November of 2017, Best Western® Hotels & Resorts prepared to host its North American Convention, an annual event that takes place each fall and connects the company’s executive team with members to share key developments and news. As Best Western sought to evolve this event – mirroring its own ongoing company evolution – it worked with its PR firm to craft a media strategy that would take things to the next level. The event was slated to take place in Nashville, TN with a single word - “Imagine” - serving as a fitting theme for the imaginative, evolving Best Western brand. The corporate communications team and PR firm worked together to “imagine” the optimal media strategy to share news coming out of convention with the industry at large, as well as the traveling public. Please provide a brief background on the project and your company efforts to demonstrate good corporate citizenship. We hope to recognize the standout environmental, social and governance performance of companies in hospitality, and celebrate the most successful ones that report on their responsible practices. What did organization set out to achieve in undertaking this project in CSR? What were the goals you set to measure your success? What new and innovated ideas did you incorporate in either your method of outreach or in the implementation of the project that you think could inspire others committed to CSR from the tourism and travel industry? Clearly state your marketing goals. What did your company strive to achieve using this piece or program? Best Western tasked its PR firm with finding a way to share a variety of news and developments coming out of its Annual North American Convention with the industry at large. The primary goal was to tap into one ore more key hotel trade publications to tell the story of Best Western’s innovation and imaginative evolution with those who follow industry news. 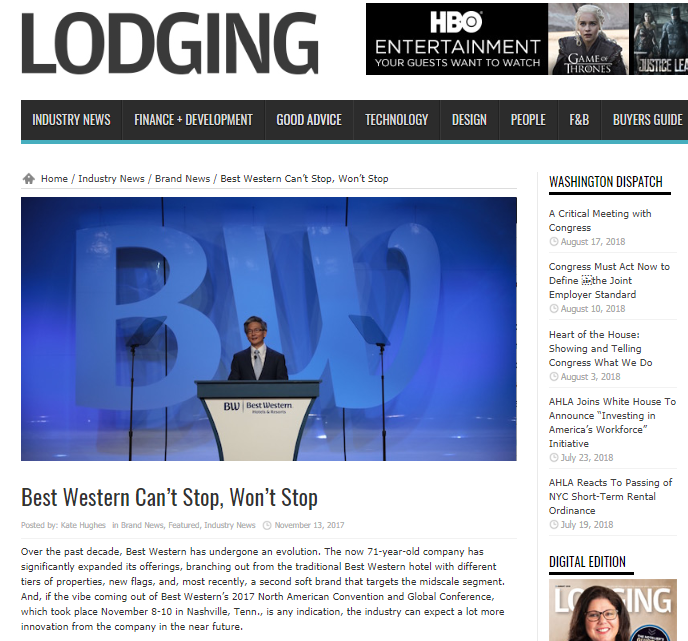 It was important to secure news coverage of Best Western’s Convention announcements that would use the event as a timely hook, underscoring the strength of the Best Western brand in the hospitality market and its ongoing commitment to innovation. The goal was to emphasize what an exciting time this is for the company and tee up a bright future ahead, getting the development community, specifically, excited about Best Western. How did you communicate your actions to the public, the media and other key stakeholders and what was the aim of the message? Transparency and public commitments help make a company's sustainability program even stronger. How did you measure the effectiveness of your efforts and what direct and tangible results did you achieve? Please be as specific as possible and share the full impact of your efforts in CSR. Understandably, maintenance is another major part of CSR. If you have continued to actively and consistently work on your CSR process; please add those actions to your results description. Who was/is the target audience? Characterize the composition, size, and location of your target audience. The target audience for this particular placement was the hospitality trade press and ultimately, industry professionals and developers (prospective members) who read those outlets. To keep your CSR efforts thriving, you need momentum and passion, which has to come from the top. Please list the individual in a leadership role responsible for the project and how would you characterize their commitment to promoting corporate social responsibility in the travel and tourism industry? What market research was conducted prior to planning the piece/campaign? Describe how you planned and produced the creative asseets with the mobile canvas in mind. Best Western’s PR agency crafted a target list of travel and hospitality trade media who were the ideal targets to attend and cover convention. Understanding how critical it was to bring the media who speak directly to the hospitality industry at large to the event itself, the agency invited Lodging Magazine editor Kate Hughes – offering her some exclusive opportunities for face time with the executive team, should she be able to attend. She did, and her coverage of the event lead to the incredibly impactful “Best Western Can’t Stop, Won’t Stop” feature story that appeared on LodgingMagazine.com. What is the key message intended for the piece/campaign? What differentiates your piece/campaign in the marketplace? The message of the resulting story was simple: Best Western Hotels & Resorts may have 71 years under its belt, but if the latest news coming from the company’s recent annual convention is any indication, there is much more innovation to come from the iconic hotel brand. They are just getting started! Innovation Analysis: Please provide a brief background on the project and why you feel it fits the definition of innovation, what the breakout implications are and how it was an industry disruptor. Which of your original goals did you achieve and how? How did you measure the effectiveness of the piece or campaign? Entrants should provide quantifiable results of their tactics or campaigns. “Best Western Can’t Stop, Won’t Stop” was the headline for Kate Hughes’ convention feature story and not only did this excite the company’s executive team and membership base, but it knocked it out of the park from a messaging standpoint, exceeding expectations. The piece opened with, in part, “if the vibe coming out of Best Western’s 2017 North American Convention and Global Conference, which took place November 8-10 in Nashville, Tenn., is any indication, the industry can expect a lot more innovation from the company in the near future.” It closed with “despite the company’s 70+ years in the industry, it was apparent at Best Western’s convention that the company approaches hospitality like a scrappy newcomer, always looking for opportunities to innovate and grow.” The piece was read by 17,400 unique monthly visitors, 100% of whom were the exact target audience for the communications and PR team surrounding convention. Goals and Objectives: What were the goals of the innovative project, and were they met? Were they tied to a business plan? A larger campaign? Or to get specific result (such as views, shares, influencer engagement, or bookings)? And what obstacles did you encounter in the execution of the project and how did you overcome them? What market research was conducted prior to planning the piece/campaign? Describe how you planned and produced the creative assets with the mobile canvas in mind. What is the key messages intended for the piece/ campaign? What helped you breakthrough on mobile? What original goals did you achieve and how? How did you measure the effectiveness of the piece or campaign? Entrants should provide quantifiable metrics tied to real business results (eg brand lift, leads, or bookings generated). Sources of Innovation: Did the innovative project result from chance, from research, from inspiration from outside the industry, or from some other source? Please provide a brief background on the project and your efforts to preserve the destination’s natural, cultural and historic heritage. What did organization set out to achieve in undertaking this project? What new and innovative ideas did you incorporate in either your method of outreach or in the implementation of the project that you think could inspire others committed to sustainability in the tourism and travel industry? How did you communicate your actions to the public, the media and other key stakeholders and what was the aim of the message? How did you generate publicity in order to build awareness of, or support corporate values on your sustainability initiatives. How did you measure the effectiveness of your efforts and what direct and tangible results did you achieve? Please list the individual in a leadership role responsible for the project and how would you characterize their commitment to promoting preservation and sustainability best practices in the travel and tourism industry? All contents @ 2017 OMNI Solutions Group, Inc.